Last week I was in Gulu, Uganda, one of the largest cities in “Acholiland,” a part of Northern Uganda. Many of the poorest of the poor farmers in Uganda currently live in this region, which was once described to me as the “breadbasket of Uganda.” Just a few years ago, this city was engulfed in the horrific conflict between the Lord’s Resistance Army and Ugandan Defense Forces. Both sides committed atrocities during the conflict. Somewhere between one and two million people, which is most of the population of Acholiland, were put into “Internally Displaced People” camps. Since the LRA was raiding rural villages to steal food, kids, and whatever else they wanted, this action was meant to strategically reduce agricultural production, and starve the LRA out of the bush areas were they were hiding. By now, most people have left the camps and are returning to farmland. Agricultural training is a huge problem in this area, as many young people grew up in the camps, and have never had a job, education, or agricultural experience. However, even more dire is the need for basic agricultural infrastructure, such as decent roads, electricity, irrigation, and access to decent seed. In some ways, Acholiland is in a transitional phase – war has reduced infrastructure building, and many of the small scale projects that the Gates ICT for Ag calls for will likely have little impact until this basic post-war infrastructure can be installed. There are some lingering challenges in this area that will likely outlast transitional infrastructure building projects. It would take a whole book to describe the complex social and economic issues that have raged in this region, but in short, due to the government’s questionable treatment of people in IDP camps during the LRA conflict (many of which were Acholi), there is a great deal of mistrust of government ag agencies, such as NAADS. Because of the dire circumstances of people in this region, it’s difficult to leave some of these problems behind. There are countless challenges that ICT solutions could be used to address. However, the Gates ICT in Ag grant calls for innovative and scalable ideas, and many people in Acholiland likely need more basic things like large scale civil engineering projects. That’s not to say that a project involving ag extension might not have an impact, but for farmers to take part in agricultural economics, they first need roads, electricity, and markets. I was hit with a really bad head cold on Friday and Saturday, so I was spent Saturday sleeping it off under the mosquito net. By Saturday night, I was finally feeling better, and sat outside my hotel talking to people who were passing by. I even attempted to fix someone’s busted cell phone, until I realised it was a lost cause. Many of the most promising contacts that we collected in Kampala are not in town at the moment, which has been frustrating. My Grameen contact, Bernard, is out and about, and will not make it to Gulu for another few days. Others, such as our contacts from USAID and ACDI/VOCA are traveling, and won’t be back in town until the end of the week. While frustrating, it just means that I will have to shift into party crasher mode and drop into some of the various NGO and University offices around town. As we were told in Kampala, Gulu is overstuffed with NGOs. Some of the people around town that I have talked to are quite critical of the NGO presence, and feel that many fail to address major problems such as lack of access to education. The larger NGOs are set up in what looks to me like fortresses – high walls, barbed wire, guards with guns. Several of the people I talked to mentioned that the NGOs mean well, but the money “rarely hits the ground.” One person told me that some of the larger NGOs have fancy cars and drivers for their staff, but won’t stop to help people in town when they need a ride. The walled off organizations on the outskirts of town (UNHRC, UNDP, FAO) definitely give off an aura of exclusivity, and provide quite an architectural contrast with the many tuckels (huts, pronounced “tookles”) that can be found in the center of town. Acholi is one of the major languages of Gulu, the IDPs, and the Lord’s Resistance Army. From various people in town, I have learned to say “What’s up?,” “I am fine,” and “Thank You,” but my limited brain has struggled to remember more complicated phrases. By the way, about radio: many people may have radios, they are all over town and the market, (I will find out more about radio listenership this week), but unless my brand new Grundig mini FM/AM/Shortwave receiver is broken, I can only get 4 stations from the middle of the city. What can people hear in the villages outside of town? Some of the stations are broadcasting the same content on multiple frequencies. Finally, before I got here, I heard that Kenny Rodgers and Dolly Parton were cool in Uganda, but I could find no evidence of this in Kampala. However, I can now confirm Ugandan love of Rodgers and Parton after visiting the Havana Pub, a place recommended by locals. Sure enough, while American hip-hop blared, the video screen was showing vintage clips of Kenny Rodgers and Dolly Parton (and 80s-era Kylie Minogue??). Awesome. Every time a user of MTN Uganda’s pay-as-you-go mobile service makes a call, SMS, or tops up, a message about the amount of remaining credit appears on the phone. Today when I topped up my account, I received this message (see pic) – an advertisement for Google SMS, a service created in partnership with our host org, Grameen Foundation AppLab. On Friday, Michael, Charlene and I went our separate ways to explore further, the players and issues in agricultural development and IT outside of Kampala. Having been in Kampala for a little over a week, talking with people about farming and IT, I think we all were eager to get out into the country to meet farmers and see farms. Michael and I rode post buses out of Kampala. When asked about traveling by bus, Bridget, our coordination contact from AppLab, said “I fear them.” Not a ringing endorsement. The post bus is noted in Lonely Planet as being quite safe, and after purchasing tickets, our host in Kampala, Grace, gave his approval, “That is a good one.” So I boarded with a relative sense of ease. We’ve been hearing a lot about the lack of knowledge around ag practices like planting in rows and the lack of market mechanisms for getting product to market, but driving out of Kampala, I noticed many fields, all seemingly planted in rows, and many markets as well as large trucks full of matoke (plantains, the staple food of Uganda). Will look forward to getting to the bottom of how the observed practices and the reported issues relate. I met with the MTN sales rep for this region on Fri after arriving, and I will plan to head out with his mobile sales team Mon or Tues. The mobile sales team spends 6 days a week in the field, driving out from Mbale and other towns with payphones and sim cards to sell. I’m hoping to learn a bit more about how these vans and MTN products are received in towns and villages. Saturday, I went out to Sipi Falls where I heard there are lovely falls and hikes. I ended up meeting a guide, Patrick, who is also a farmer and is from a farming family in Sipi Falls. He offered to make me a guest of the family’s for the night, so I stayed, met the family, had tours of the town and walked through farms planted with – coffee, kasava, matoke, bananas, wild bananas, maize, pumpkin, cabbage, tomatoes. Many of the farms in this region were large – some as big as 10-30 acres, so I’m not sure that this is a region that our work will focus on, but I did pass a number of signs advertising farm schools and projects, so will look into those. Regardless, I think it was a good introduction to the field and eased my worry that it might be a hard to meet and speak with farmers. Note: We’ve heard a lot from people about ag dev around crops, so on the lookout for groups that focus on livestock and aquaculture – I hear the northeast, Karamoja, is the place for cows, and I saw a large lake from the top of a hike yesterday that is near Soroti and might be a place to find aquaculture work. Having trouble keeping the ants, mosquitoes, and bedbugs away? Try “Tox,” proudly made in the Sultanate of Oman. I think that it is a great sign when you find a bottle of Tox in the bathroom upon arrival. Why don’t you try some Tox today? During these interviews, I have been throwing out increasingly leading questions about the connections between tribal affiliations and the potential for an individual to become a rural community leader. I have yet to hear much about ethnic tension in rural communities from anyone we interview, but the housekeeper at the place we are staying has related all kinds of non-politically correct stories about tribal groups in western Uganda. For example, in Hoima, I am going to have to watch out for a bewitching, which will cause me to vomit frogs. However, since I am a Muzungu, I am not very likely to get bewitched. Was she joking, or relating to me a narrative about something she truly believes in? During lunch today, Becky mentioned that no one has been biting on my questions about ethnic issues. Her brilliant idea was to revise the question, and ask it in a way that forces the subject to directly respond to the issue. The lesson: don’t give the interviewee too much wiggle room to sneak around the question. A common assumption of many people who create agricultural extension projects seems to be that training a “community leader” in agricultural techniques will create a local information source that will improve the knowledge of the rest of the community. One of the things we are investigating is the tension between this assumption and the reality on the ground. Grameen, for example, provides smartphones to “Community Knowledge Workers,” (or CKWs) who then use these devices to help rural Ugandans search for information online. But how are these CKWs identified and hired? Are they the smartest? The loudest? The most educated? All of the above? Do the CKWs reflect some kind of bias that would dissuade other community members from utilizing the ICT services that they provide? Well, it’s our fourth night in Ethiopia and George, Benoit, Yuri, Stefan, and I are slowly learning the ropes here in Addis Ababa. After having a Sunday to adjust to jet lag and plan our initial approach, we meet with Catholic Relief Services (CRS) on Monday morning, where Legesse and Gure, two of CRS’s agricultural economists, gave us a rundown of all of the agricultural, health, natural resource, and food programs that they facilitate. CRS is connected to dozens (at least) of projects throughout Ethiopia, and have given us lots of connections. CRS also invited us to the Rift Valley, a drought-prone area south of Addis, where one of their ground projects is underway (producing white beans for export to the EU). Gure will accompany us there on Monday (we’re driving to Nazret), where we hope to talk to farmers, farmer cooperatives, cooperative unions, traders, extension agents, shopkeepers, exporters, and whoever else we might discover as a participant in this rather complex supply chain. In the meantime, we’re trying to meet with as many of the NGOs, government institutions, and export companies as possible while we’re in the capital (which is the operational center for the country). We’ve already met with some other NGOs (USAID and Oxfam), a marketing agency (Fintrac), an export company (ACOS), and have meetings later in the week with CARE (who has done a ICT market information project), the Rainforest Alliance, and an agricultural research institute. We’ve also met up with a young Ethiopian instructor at a university in E. Ethiopia, Ameha, who has degrees both in agriculture and in information management systems (and is interested in applying to the iSchool!). He said that he’d be able to take us to visit the local school of information in Addis Ababa to learn about their perspective regarding the state of ICT in Ethiopia (and anything else). He will also accompany us to our meetings this week. We feel fortunate to have the benefit of this local, student viewpoint! Regarding the state of ICT in Ethiopia, we’re learning, first-hand, about the many challenges of a government-controlled telecommunications and network system. Since the government is the only wireless provider, making mobile phone calls is really expensive, service is sketchy (even in the capital city), and mobile phone ownership is not as ubiquitous as we had hoped. This has already been cited as a universal challenge by all the entities with whom we’ve spoken. The network is also unreliable, and there have been rolling blackouts daily. Looks like we’re going to have to get creative! OK. Now fun stuff! The food here is incredible (injera is very tasty), and as the rookie international traveller, every sight has completely blown my mind — herds of goats amidst roaring traffic, often no functioning traffic lights in a city of several million. The cab drivers are like road acrobats. And everything, everything is negotiated — from cab fare to sim cards. We already had a few minor adventures finding local restaurants and walking around the market. What an experience! We’re thinking about you all in Uganda, Rwanda, and elsewhere, and it’s so nice to hear about your thoughts and travels through this blog. Keep us posted! 2 days ago in Uganda, newspapers announced that the current president, Museveni (abbreviated in the press as “M7”), aims to stay in power until 2021. It’s an interesting move: a political leader that declares his presidential intentions an entire decade ahead of schedule… it seems to indicate that the leader has lost the confidence to carry the electorate over the next few elections. Our host in Kampala claims that M7’s growing unpopularity in Kampala is tempered by popular support in rural areas. It seems that Museveni’s political strategy is to woo the rural vote by providing farmers with, among other things, agricultural inputs. A recently launched agricultural program (whose name elicited eye rolls from one of our recent interviewees) is the poorly named “Prosperity for All,” which attempts to provide a select group of agricultural industries with agriculture extension aid. I didn’t find it easy to find good media coverage – here is a brief Guardian UK post mentioning it, and here is a Ugandan editorial about the program. It is clear that one challenge Becky, Charlene and I will have to undertake is the unpacking of the roles of each ingredient in the Ugandan agriculture extension alphabet soup. 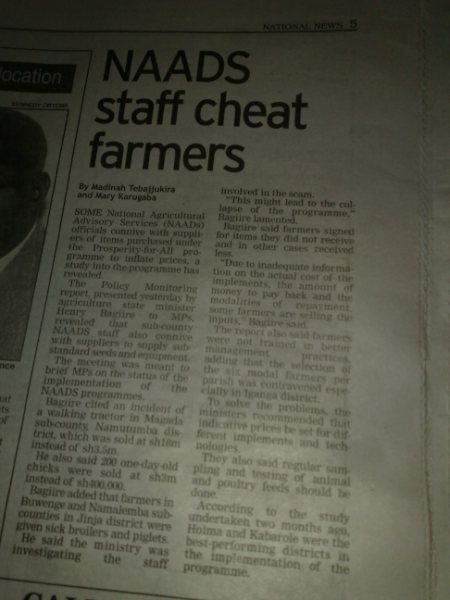 Some groups, like NAADS and NARO, are government run, but appear to be funded in part by international aid. Thus, when outside funding dries up due to recession, these agencies face the possibility of losing influence and momentum. Other players, like USAID, may possibly provide stable program funding, but may also prioritize American economic interests above the interests of small scale farmers. We have many questions to explore, as we begin to dig through the role of various nodes in the Ugandan agricultural network. So what does this mean for our project? Primarily, it informs our group about the need to take into account unpredictable political forces that assert pressure outside the market. For example, if external inputs are being provided to a selection of farmers simply for political reasons, the scalability of an ICT innovation might be affected. The kind people at the Kigali Institute of Science and Technology (KIST) have agreed to let me use one of their classrooms for the month, and the head of their ICT training program helped pick out 6 of their top students, all of whom were interested in working as RAs with me this month. In the end, I hired two: together they’ll help me coordinate the phone survey I’ll be running over the next few weeks, and will also serve as impromptu translators and helpers with the random things that come up. This coming week we’ll start piloting the survey, and hiring a handful of other students to work as surveyors. Also in the mix was a bunch of meetings with people from various ministries. The Rwanda Information Technology Authority has about 100 employees, and coordinates all the government-related ICT deployments. Worth following up with them on an SMS-based system to collect commodity prices, due to launch next month, in cooperation with Voxiva. Also met with a woman from the National Institute of Statistics of Rwanda, who will hopefully be able to help me write my survey in an intelligent way, and connect me to people at the Ministry of Agriculture. Lastly, I met with a contractor at RITA who, with his kid brother, are about to start a company that uses ICT’s to collect and resell milk in the eastern district of Gatsibo. Am hoping to go visit their dairy farm of 80 cows at some point. Less formally, I went to an ex-pat pig roast that was completely overrun with young ngo workers. The regional director of technoserve was there with a group of his employees, whom I will hopefully soon have a chance to talk to when everyone is more sober. A great group of people was also there from the One Acre Fund. OAF work with 5,000 farmers in the far western district of Nyamasheke (and also have operations in Kenya and somewhere else). They work with smallholder farmers to get them high quality seed and fertilizer, using a joint-liability lending model. Though it’s unclear whether they have much use for ICT’s at this point, I’ll probably make the trip out there next week to shadow one of the guys as he makes the rounds with a set of bean farmers. Finally, there were some fun things. I put some youtube videos up of this weird moto-polo thing that the expats do here: http://www.youtube.com/watch?v=HfCmpP5VFGQ I also happened to be around for the 15th anniversary of the end of the Genocide, at which Kagame, Museveni, and some others spoke. The crowd was enthusiastic (http://www.youtube.com/watch?v=XJsYeCYknlc and http://www.youtube.com/watch?v=gAji4XxMEnw). Guess that’s it. Looking ahead, this week my collaborator from SFI will be in town, I’m going to try to get the pilot underway, and also talk to the people from SIMTEL and George’s from from Voxiva. And again, if anyone out there wants a short break, Kigali is a beautiful, friendly city.